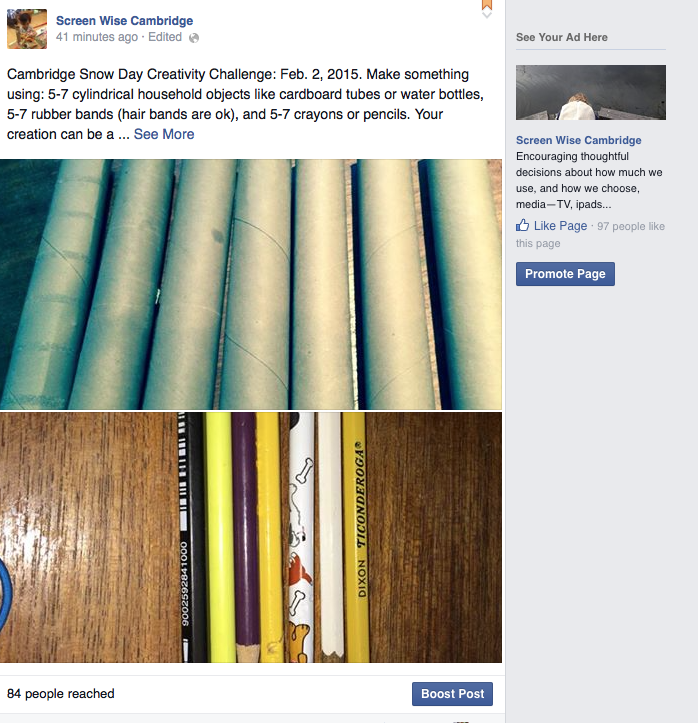 Materials you can use for the Screen Wise Cambridge Snow Day Challenge. Your creation can be a building, a human or animal figure, an abstract sculpture, a machine, a tool, a poem or story, in fact anything at all! Use the above items only. You can use scissors or other tools as long as you don’t add any additional items. i.e., no tape, no glue! 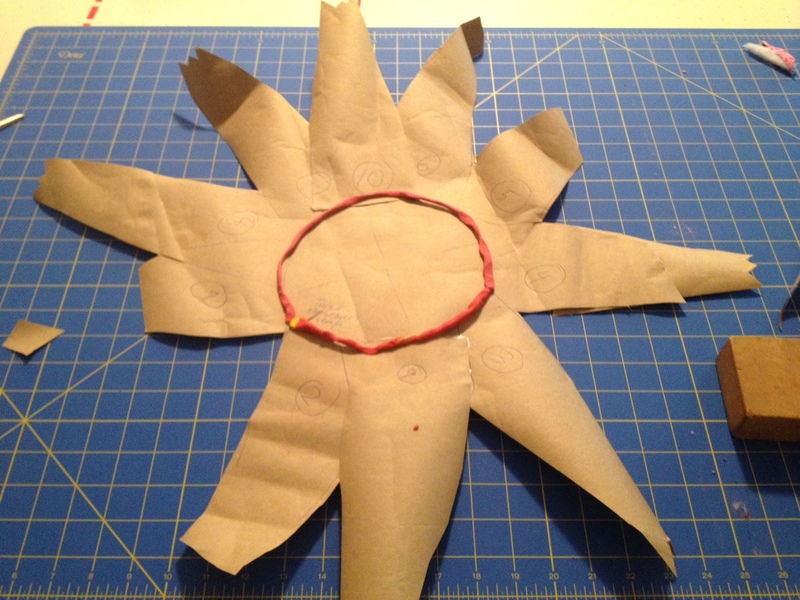 (If you absolutely can’t resist using tape or glue, don’t give up—we’re still interested in what you make, but do try the real challenge first). Post the photos of your finished creations (and a caption or description) to the Screen Wise Cambridge Facebook page or post them as a comment below. (Be sure to say if you have used tape or glue). Also post your questions here if you have any. Multigenerational teams are welcome to participate, whether parent-child or not. There are no age restrictions. Categories: Imagination, Play | Tags: activities, architecture, art, Cambridge MA, children, craft, early childhood education, elementary, engineering, high school, homeschooling, imagination, k8, makers, middle school, parenting, sculpture, STEM | Permalink. The City of Cambridge has launched a Participatory Budgeting Project earmarking $500,000 for citizen-proposed public works. A number of the proposals that have emerged from the process are playground additions or improvements; quite a few suggest traffic-calming and pro-biking infrastructure improvements. I’ve suggested that maximum benefit to the greatest number of children would be the creation of free play areas that are green, utilize existing or demarcate new open space, and provide some urban wildlife and “discovery” opportunities for kids. Such green free play areas needn’t be separate proposals, but could result from further elaboration of several existing proposals. Exposure to nature has freestanding, positive effects on mental health, independent of the physical activity that is also often enabled by parks. Research increasingly supports this benefit, one which most Cambridge children do not enjoy. 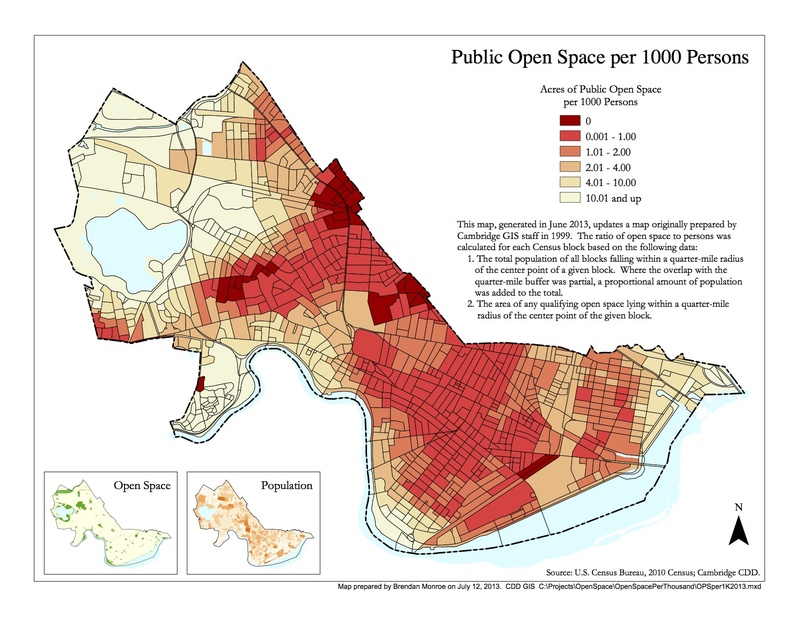 Most of our city’s green space—of any significance, habitat-wise—is highly concentrated at one end of the city (Alewife Reservation, Fresh Pond Reservation, Danehy Park, and Mount Auburn Cemetery), as I’ve written previously here. These four large open space areas are, for a host of reasons and with many exceptions, not generally used for unstructured recreation (also known as “playing outdoors”) by the vast majority of the children and youth who live in Cambridge. Some may dispute this assertion, especially with regard to Danehy Park. The devil is in the details. Showing Donnelly Park (not very well, I’m afraid) just south of Cambridge Street, outside Inman Square, with less public open space in keyed to population density. Here’s a link to a proposal for a park near Hampshire Street in Cambridge, where I’ve commented about making such a tweak to increase the breadth of kids’ chances to “play outdoors” in a larger sense. Here’s a proposal for a partial transformation of Donnelly Field, to which I’ve appended a similar suggestion (Donnelly Field on Google Maps). The days of old-fashioned playgrounds are over. Children’s brains are starving for imaginative play, and play in natural settings, involving the whole mind as well as the body. The full sensory impact of plants, trees, birds, water; digging and creating tiny villages in dirt and sand; climbing, balancing, playing hide-and-seek around, and jumping on and off logs and boulders; even picking (yes, picking!) wildflowers—these are the play opportunities that have been lost to city kids, and what we must restore to them. Categories: Cambridge, Children, Play | Permalink. Helianthus strumosus. 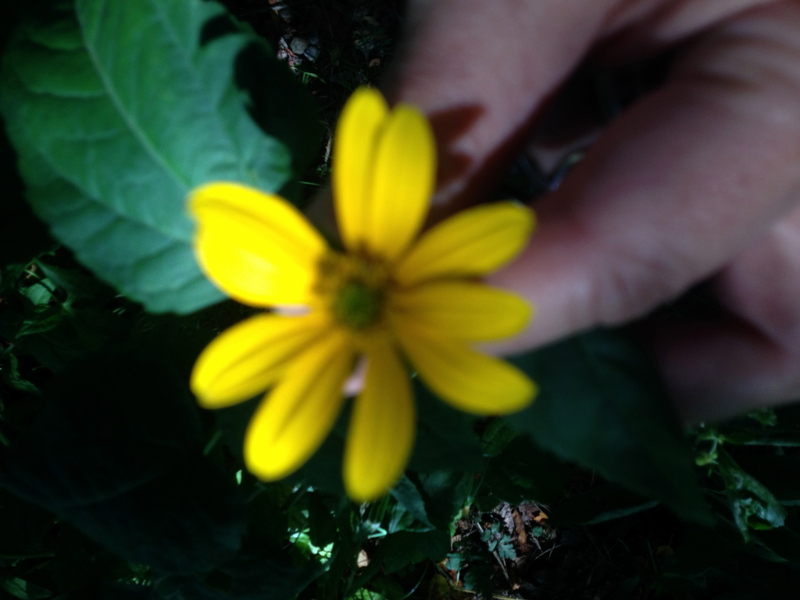 Have you seen these tall flowers, yellow at center and yellow on the petals? They’re not the Yellow Coneflowers that feature brown centers and yellow petals. These sunflowers are abundant at Fresh Pond Reservation. Thin-Leaved Sunflower (Helianthus strumosus) is our best working guess as to what they are. We’ll have some good headgear to loan out to plucky Cambridge citizens and kids who want to represent this meadow flower in the Honk! Parade on October 12th….sewing machines and giant doll needles are being deployed as we speak. 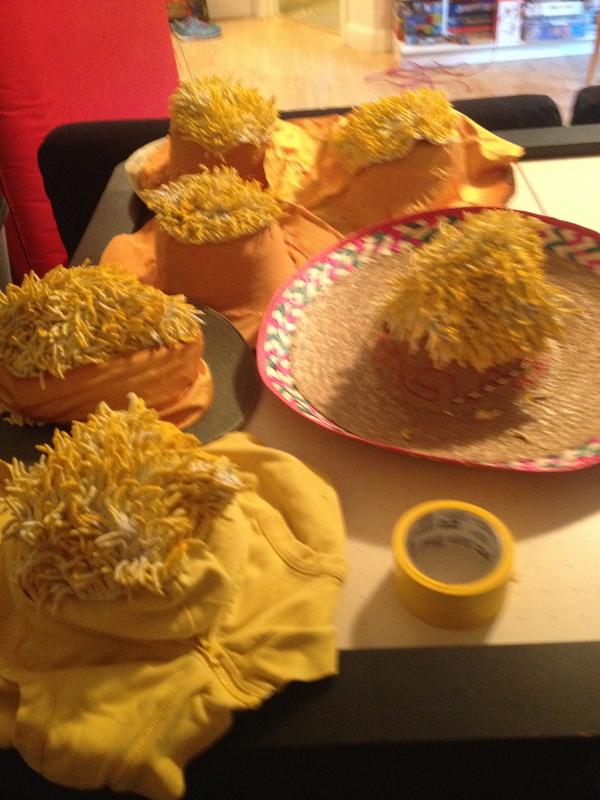 Speaking of coneflowers, we are working on Echinacea purpurea hats as well. In previous years, we’ve created two giant Great Blue Heron puppets, a fish, and dragonfly and damselfly wings. If you’re interested in Fresh Pond Creatures at the Honk! 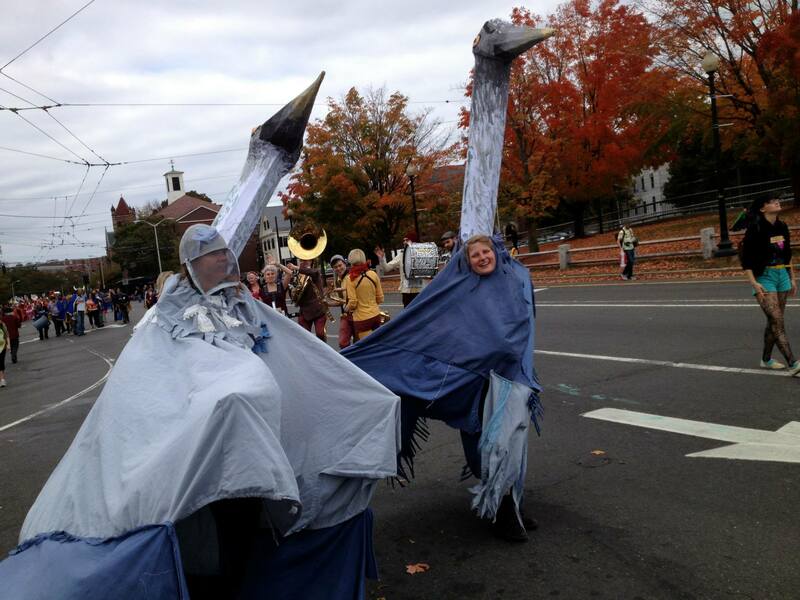 Parade, contact Ranger Jean at jrogers@cambridgema.gov or 508 562-7605. 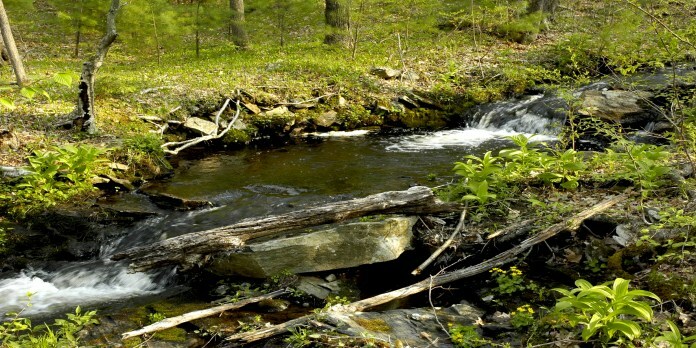 Categories: Cambridge, Massachusetts, Play, Wildlife | Tags: Fresh Pond Reservation | Permalink. Here’s a preview of my annual Greater Boston guessing game for kids during Screen-Free Week. Yes, you’re looking at a screen right now. But consider printing it or, if you’re on your smartphone to “scavenge” these secret places, think of all the adventures without a screen these clues will lead you to! 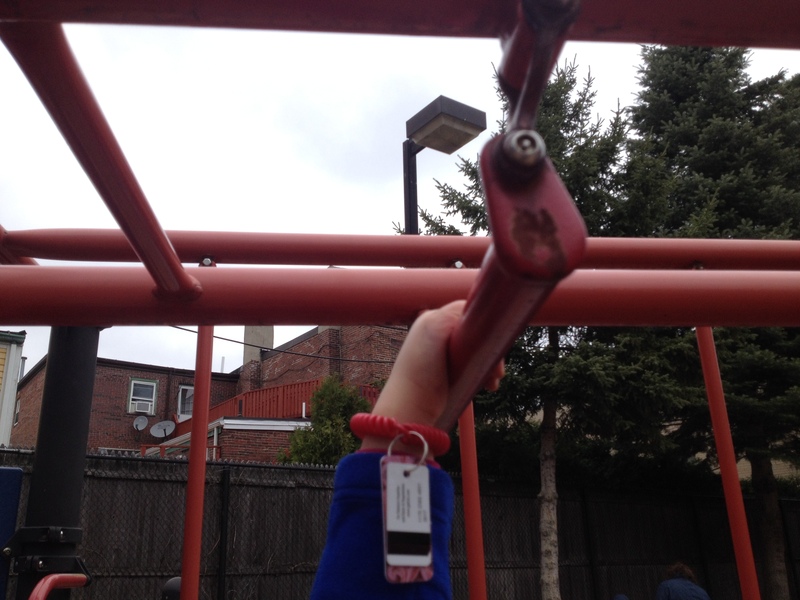 Each of these images is of a “handhold” (something you can grab) on a piece of playground equipment (or other climbable object) in Cambridge, Mass., in an “open space.” Most, but not all, are from parks and playgrounds. Ready to play? Name that handhold! (Let’s call this one Mystery Park Number One). Need a hint? Click here to see a natural object and something made by a human in the same location. Did that help? Now name that one. this is Mystery Park Number Two. Need a hint? Click here to see a natural object and something made by a human in the same location. 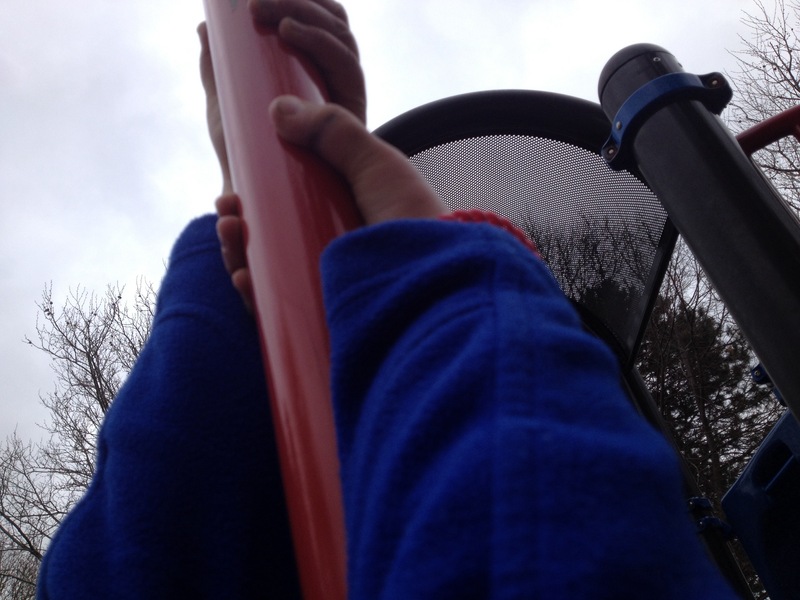 Below is the handhold clue in Mystery Park Number Three. Remember, all of these are in Cambridge, Massachusetts! Need a hint to figure out where Mystery Park Number Three is? Click here for a hint! And here is Number Four! How are you doing so far? 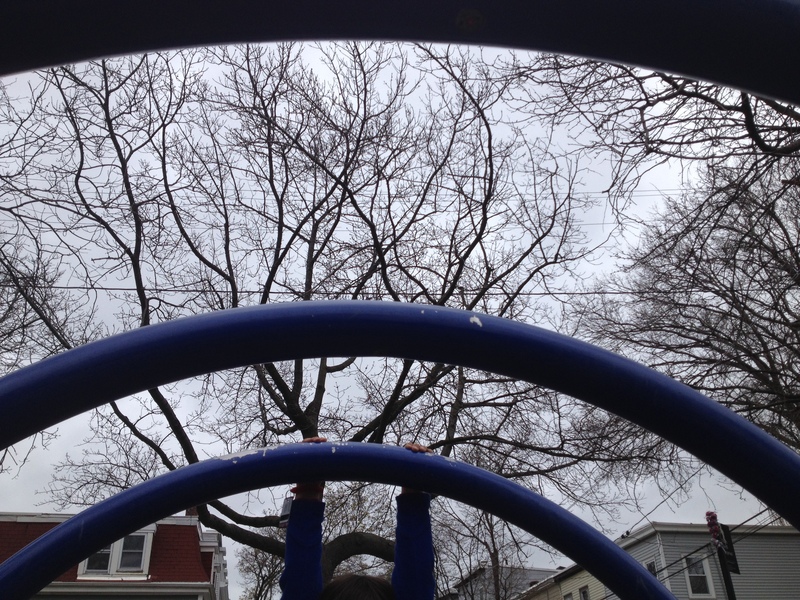 Here are some more clues to help you figure out which park in Cambridge is Mystery Park Number Four. Categories: Children, Play | Permalink. My daughter seemed interested in coming outside with me this morning to check out the neighborhood owl. It has a regular shift at the entry to its nest, but that happens to coincide with the chaos of getting to school (not) on time. “But mommy,” she said, “I need a new bike helmet.” While this might in fact seem like a Stuff (capital S)-obsessed response to an invitation to an encounter with an animal thriving in its habitat, she has, in fact, outgrown her bicycle helmet, and biking would be a reasonable and pleasant way to take this outing. The fact is, we could walk, but she vehemently opposed walking the half-mile or so to the Place of Owl. Despite this reluctance, she’s enthusiastic about the larger idea I proposed—that we visit the spot every week from now on, early on a Saturday morning. She even proposed writing an “owl schedule” on which we could record when we saw owl babies appear and other such milestones. 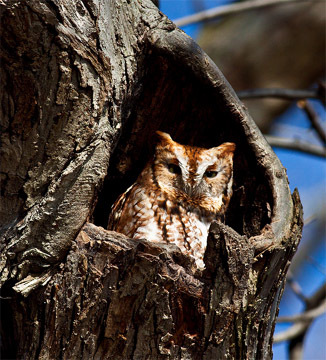 What was striking, and what I want to comment on here, is the hard parameters that seemed to take root almost instantly around the concept of owl viewing. Not only was I wishing, seemingly on her behalf, that the shock and awe of seeing a real live own would trump her antipathy to walking, but I was so trapped in my own script—as she was in hers—that we couldn’t resolve the problem. After all, it was my problem; she had no stake in resolving it. The concept of “scripts” in childhood, in play and in interactions, as far as I know, isn’t new. But media, i.e., the scripts of others, are more often than not designed to displace or distort an individual child’s own script, to provide solutions and plot lines, to hijack the child. So often today it is as if children are being remote-controlled by the scripts of others [television, videos, electronic toys], instead of coming up with their own unique stories and problems to solve. [Remote-control childhood] is exactly the opposite of [a child’s] play, where he worked out a unique problem in a unique way, and learned how to have wonderful ideas that furthered both his development and the sense of satisfaction that can come from working things out on his own. Remote-control childhood] undermines children’s ability to come up with wonderful ideas of their own creation and, instead, promotes the rote learning that is a carbon copy of the script creators. via Moving Beyond Remote-Controlled Teaching and Learning » Diane E. Levin. I agree wholeheartedly with Diane Levin’s critique of the “script” but I think her critique deserves extension. She is barking up the Montessori tree, which by now, a hundred some years later, has created so many saplings and grafts and branches that there really is no excuse for disempowering children, even in such small matters as a bike ride in the neighborhood. 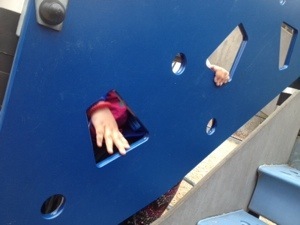 We hijack children, even our own, from piloting their own course of play. We’re constantly introducing new problems from the adult world into theirs. Sometimes this may be necessary; sometimes, convenient for us. When we do this, are we modeling good brainstorming, adaptive thinking, critical thinking, and taking on diverse and uncomfortable points of view? When we conceive of a family project, create a plan, or fix a destination, are we enhancing—or instead circumventing— our kids’ ability to solve problems? Categories: Children, Play | Tags: critical thinking, Diane Levin, media, parenting, Television | Permalink. Mother Nature’s Child explores nature’s powerful role in children’s health and development through the experience of children of all ages. The film marks a moment in time when a living generation can still recall a childhood of free play outdoors; this will not be true for most children growing up today. The effects of “nature deficit disorder” are now being noted across the country in epidemics of child obesity, attention disorders, and depression. Discussion of how to keep city kids connected to nature will follow the film. Categories: Children, Play | Tags: Boston, children, events, nature, parenting, Richard Louv | Permalink.